For your next company car, should you engage in corporate retreat and fall back from the trad boxy saloon? Which one of these four slick compact execs should you get instead? 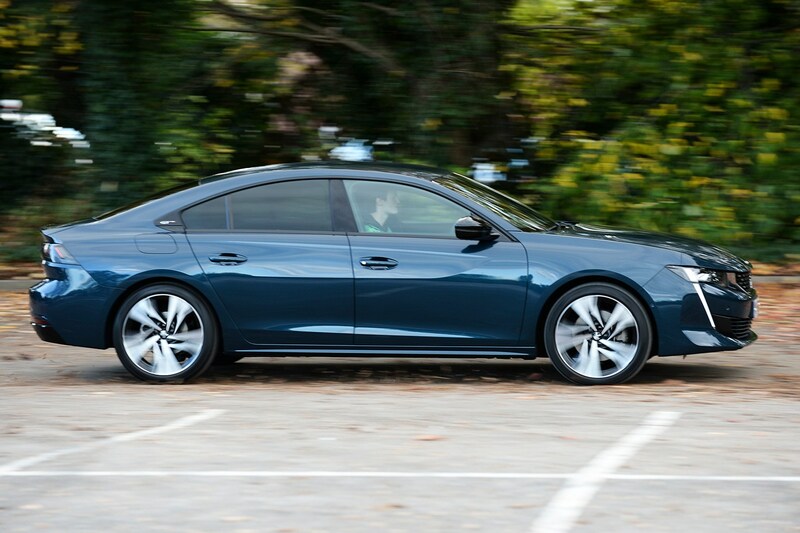 Peugeot really is on a roll – the new 508 is thoroughly un-boring to look at. It's extremely handsome even in 'don't look at me' blue with tasty rims and animated rear lights. You have to go GT-Line or GT (like this one) to get those sabre-tooth DRLs. Still a real looker, even in a sober colour and trim. It's all about curves, in stark contrast to the other three, with their angles and lines. 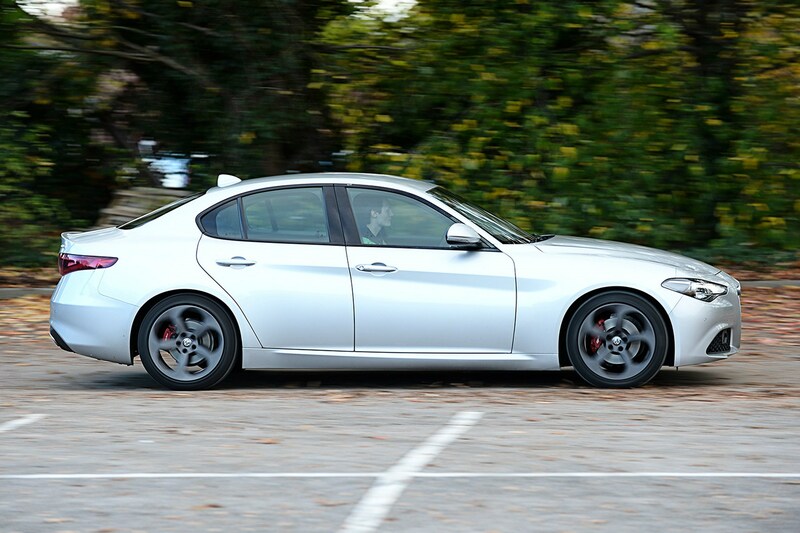 Giulia's shape is cohesive, classically Italian and not-actually-that-saloon-like. Molto, molto bene. Familiar shape that will make some nod in quiet approval at the crisp lines and clean surfaces, while others will reach for the Red Bull to help them stay awake. Ours is not in one of Audi's 400,000 different shades of grey. Hooray? 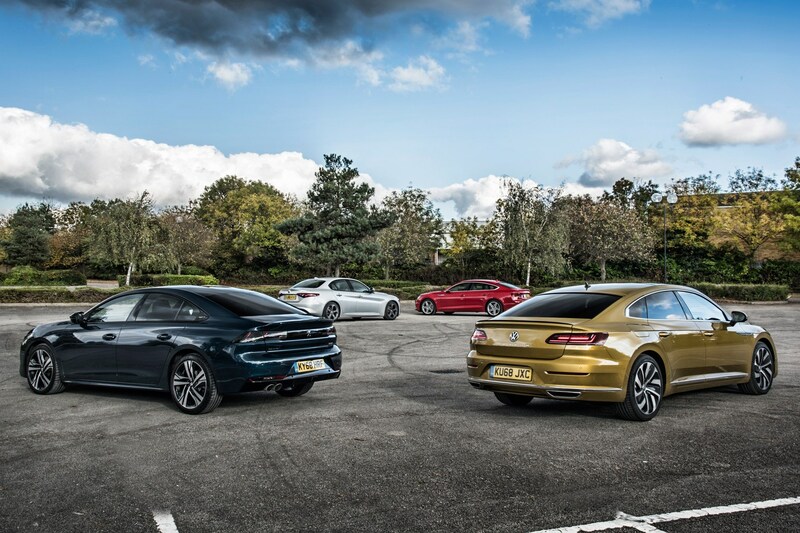 Who'd have thought a modern-day VW exec car could get any attention in the office car park? 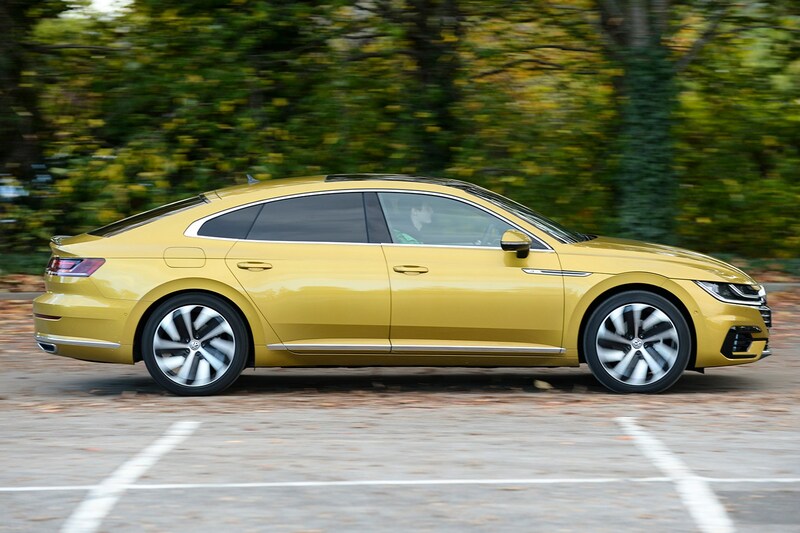 Brash grille, Spirograph alloys and sharp beltline hide its plain Passat undergarments, with details only enhanced by the korma yellow paintwork. Does it really move the needle? Top-end GT's only diesel is a 178bhp BlueHDi that feels pokey, particularly when riding the torque wave, but engine noise when accelerating is more intrusive than the VW's. Unobtrusive EAT8 auto 'box is extremely smooth, with Sport mode jolting some life into it. Engine willingly lets you know that it's a diesel, and quite a gruff one at that. Punchy delivery, though, with a smooth whump of torque to exploit via the eight-speed ZF and its gorgeous metal paddles. Manual changes in Dynamic are a little lurchy but you'll be having too much fun to care. Pretty much the same engine as the golden Volkswagen but the Audi runs slightly different mapping, to help bring the torque in earlier, and is slightly quicker on paper. It's also available in the supposedly thriftier Ultra version. 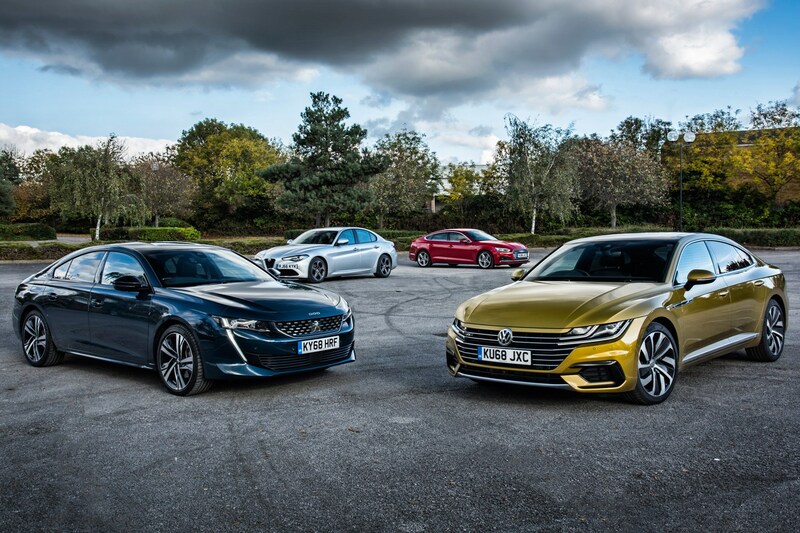 There's more power than the Alfa and 508 but that doesn't translate into particularly sprightly performance, with the torque flatter than the Peugeot in particular. Oomph from low-gear, heavy-foot cornering is neutered by hyperactive traction control. Boo. Can it go the extra mile? Active suspension kills bodyroll in Sport but can get wallowy in Comfort. It's a little louder at motorway speeds than the VW Group pair and the GT's big wheels make some potholes a little spikey. Steering via teeny wheel is precise and progressive. Steering is among the best on the market, and just as lively as the hotter QF version. Ride strikes a great balance between killing bodyroll and not making ruts too much of a fuss. Adaptive dampers can be in their 'soft' setting even in Dynamic mode. Brakes are strong, too. This one has no-cost-option Comfort suspension (Sport set-up is default) to help stave off some lumps but feels no softer than Alfa and 508. The progressive steering has a dead spot at centre and S-tronic gearbox ponders the odd hard acceleration shift. It's the most refined on the motorway, though. 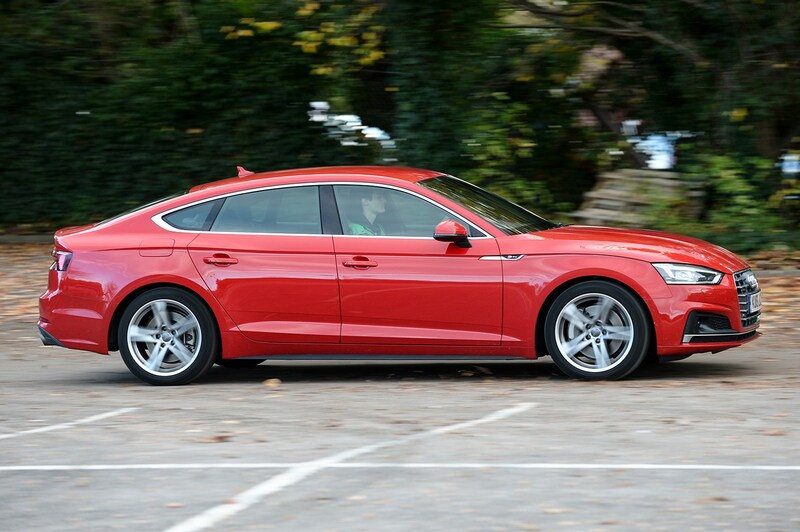 It's almost as hushed on the move as the Audi due to optional double glazing, but bigger wheels make more noise and tell you more about the road surface. Steering is mildly less dead than Audi and it corners flatter. Dynamic Chassis Control modes don't make a lot of difference. Pushing the interior design envelope past the sticky bit? Even for Peugeot this is ultra-modern and, unlike French stereotypes, well built. Cockpit has high instrument cluster with crisp graphics, and the centre console hides USBs and wireless charger. Usual PSA infotainment is still fiddly. Driving position is proper sports car fare and most of the materials are fine, but ours had wobbly dials and a sticky cupholder cover. It doesn't help that infotainment is both complicated to navigate and has the resolution of a potato. Getting on a bit compared to the futuristic Peugeot, but still well built and ergonomically sound. Blocky gear selector, perforated leather wheel and metal door handles are sweet. Buy now before Audi kills the handy rotary. And we're back in a Passat! Plainest interior here with sporty wheel and stretching air vent the only real interesting bits. Optional ergoComfort seats have active lumbar supports and carbonfibre-effect upholstery. Fastback rear cuts into headroom for the tallest of your corporate associates but legroom is good, while boot is larger than in the Audi and Alfa. Powered tailgate has hands-free function, while optional night vision will help you stop running folk over after office hours. 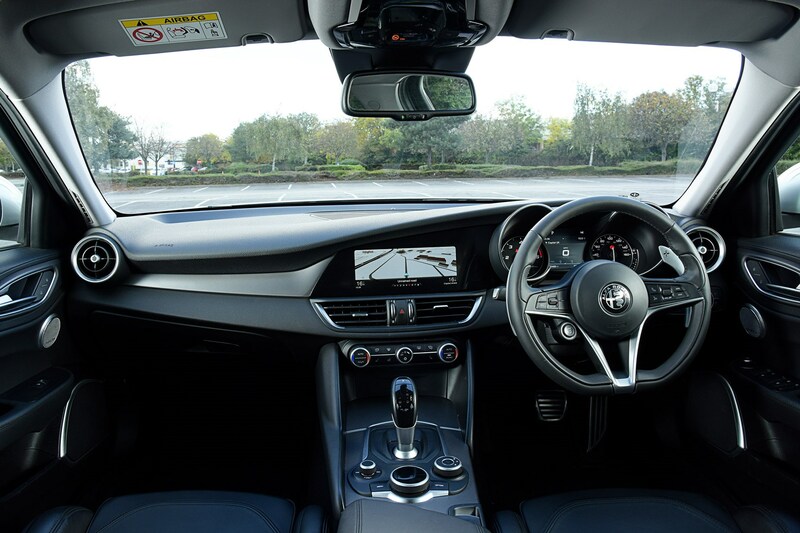 If you can get in through the narrow doors, legroom and headroom are good, but shallow windows and roof-to-floor black inside may induce claustrophobia. It's the only proper saloon here, so boot access aperture is smaller, but it's on a par for space with the Audi. 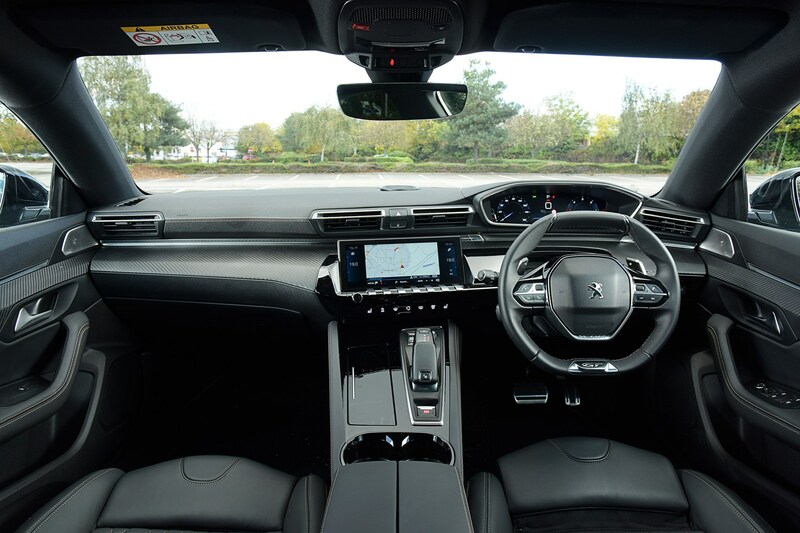 Supportive but firm seating all around is upholstered in half velour-like materials, with legroom tighter but headroom more generous than the Peugeot. The boot has the same volume as the Giulia, but access is naturally better here due to hatchback rear. Then this is the car to do it in. 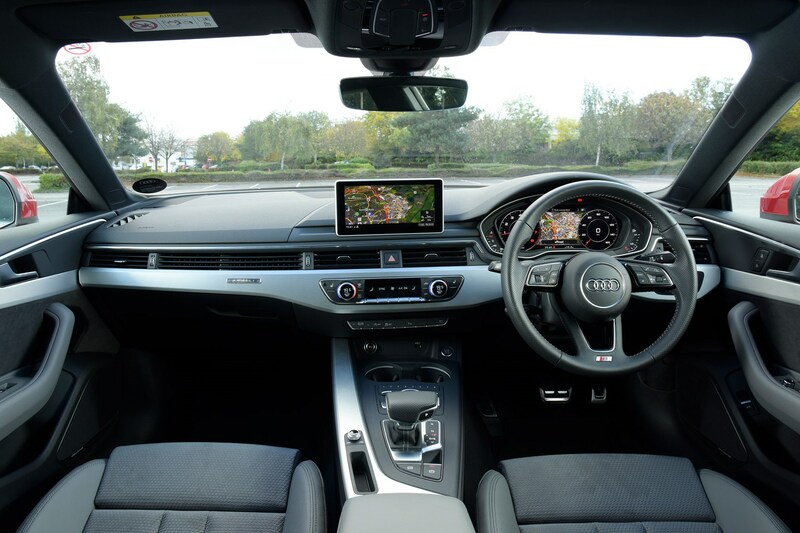 So much room in the back you could host your own sales conference, but skip the sunroof to maximise head space. Boot is also the largest here, which is almost as capacious as an Audi A6 Avant's by volume. Just behind the Germans for claimed mpg and goes toe-to-toe with them in terms of residual values, thanks to Peugeot's new tactic of not flooding its dealers with OTT ex-demos. Three-year/60,000-mile costs are 55.6ppm. Get one for £316pm**, or £441pm** in this spec. Alfa has introduced an updated diesel for the 2019 model year to pass Euro 6d-Temp emissions regs. New engine gains 9bhp (up to 186bhp) but economy is worse by 10mpg. Still the cheapest per mile to run at 51.2ppm, and you can lease one for around £345pm**. Bargain. A5 remains competitive, with similar overall running costs at 55.3ppm if you get one with the Technology Pack, and it has the best claimed fuel economy (tied with the VW). Just be careful not to go overboard on additional options. A £584pm** lease offer is a lot more than the others. The most expensive to run over three years, at 55.8ppm. It's the cheapest to lease out of the four at £312pm** mind, and is in a lower insurance group than the Audi and 508. There are both ups and downs here – just like the thumb positions of passers-by. A stunner inside and out, and now a real contender. The driver's choice for those who don't sweat the small stuff. Practical and striking, but a sheep in wolf's clothing. Classic and refined, but roundly outshone here. *Insurance quotes are from mustard.co.uk and are based on a 43-year-old employed, married male living in Stowmarket with nine years’ NCD and no claims or convictions. Insurance quotes will vary depending on individual circumstances. **Lease rates correct at time of writing and found through Parkers’ leasing broker search function for a personal contract hire deal with a nine-month initial prepayment over three years with an annual mileage limit of 10,000 miles.